South Korean giant Samsung on Monday unveiled the much awaited successor to their flagship Samsung Galaxy S4, the Galaxy S5, at the unpacked event held in Mobile World Congress in Barcelona. 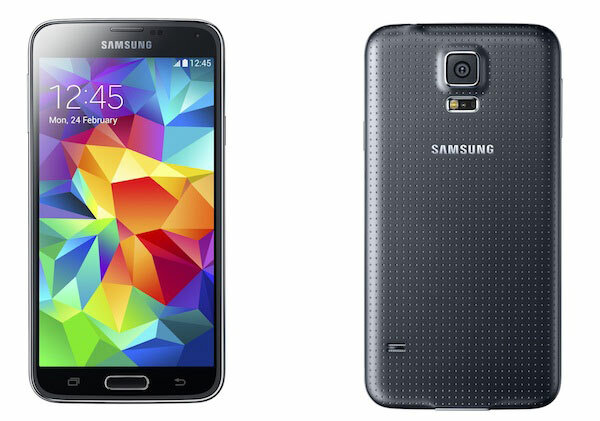 Samsung Galaxy S5 is a successor to Galaxy S4 . It is expected since it is one of the best selling models of the manufacturer. With the launch of Galaxy S5, the Korean wants to confirm its position as the market leader in smartphones. With 31% market share, it distance all competitors, including the number two in the sector, Apple (14% market share). For features: a 5.1 inch screen Super AMOLED with a resolution of 1920 × 1080, a Snapdragon processor 800 2.5 GHz, 2 GB RAM, 16-megapixel camera, a sensor for heart rate , 16 or 32GB of storage and a battery of 2800 mAh. It is compatible 4G Class 4, it can go up to 150 Mbps downstream. Wi-Fi, it features Wi-Fi MIMO improves the speed of wireless navigation. For its new model, Samsung offers Android 4.4 with some changes from previous versions including new TouchWiz icons in full color. Sweep to the left from the home screen directly displays the “My Magazine” Samsung section. The terminal waterproof and dustproof default where the USB 3.0 port that is protected. The main innovation of this smartphone is its fingerprint reader . A function with its biggest rival, the iPhone 5S of Apple , is already equipped. Eager to stand out of the U.S., Samsung has added additional services not only fingerprint recognition can identify with his phone, but it also adjusts its Internet purchases through a partnership with the leading payments online PayPal . Once a PayPal account created, simply move his finger on the reader to validate a purchase. This also helps to avoid leaving his credit card number on different merchant sites. The user can use to unlock the smartphone and access the menus using the fingerprint sensor. The footprint replaces a simple code. To use the sensor, the user must make a scan down the button. Samsung Galaxy S5 can record up to 3 fingers at the same time. In addition, the sensor can be used to pay with PayPal. Once a payment via the online payment service is required, the user can use his finger which will act as a password. Sweep up on the home button and just payment will be made. 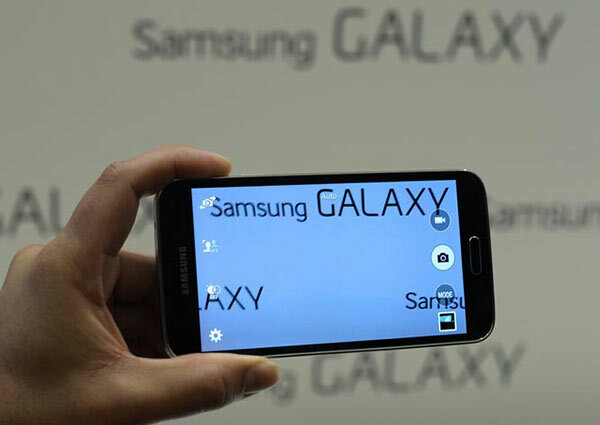 The main camera will have a resolution of 16 megapixels, compared with 13 megapixels on the S4 mode. The smartphone is able to take a picture in 0.3 seconds. The Korean manufacturer took the opportunity to add a few modes including one called “Selective Focus” which allows you to take a picture of an object, for example. Once the picture is taken, it is possible to focus on the object in question or the background to play on blur. In terms of video, the Galaxy S5 is capable of shooting 4K UHD with a resolution of 3840 × 2160 . The result not surprisingly very good, but the videos take up much space. Suffice to say that a microSD card will not be able to refuse to store everything. It is of course possible to shoot at a lower resolution. S5 then wants to surf faster than others. As the latest iPhone, Wi-Fi adopts Mimo, expected to double bandwidth technology while increasing the flow range, says a Samsung representative as well. Samsung has also included a feature called “Download Booster” . As its name suggests, it accelerates file downloads over Wi-Fi or 4G. The battery will be consumed faster of course, but this is optional. It turns on and off with a button. Samsung seems to care about this point precisely, expressing the presence of a new mode Ultra Power Saving . Activated, which cuts all the data connections, reduces the brightness of the screen and will even switch the black and white to push self to its limits. Finally, after Sony pioneered the smartphone resistant to water with its Xperia Z1 and Z2 with now, Samsung has also chosen to make its Galaxy phone S5 resistant to water and dust. The development of new uses implies that terminals are more resistant to accidents of life! 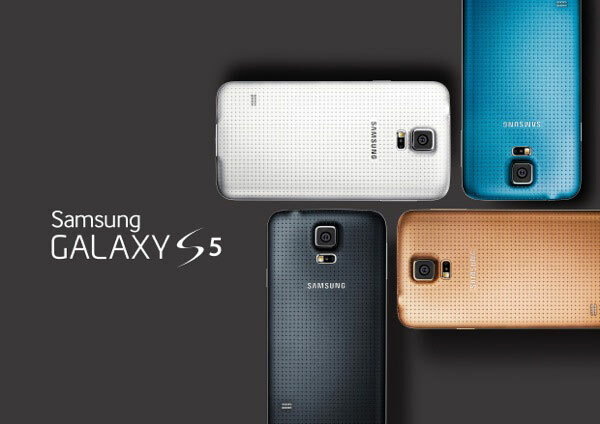 The Galaxy S5 will be available in April 2014 in four colors: black, white, blue and gold. The price was not disclosed yet.